Lucky color Gold and Purple, Lucky stone Topaz and Opal, main element water, we are talking about none other than Scorpio zodiac sign who are queer combinations of courage and vengeance, passion and determination. The second symbol of Scorpions is Eagle, and the majestic bird personifies, freedom, clarity in vision, and sharpness. Scorpio people hardly sit idle and enjoy TV; you prefer a huge friend circle throbbing with enthusiasm and vigor. Owner of a magnetic personality and tremendous will power Scorpions forget and forgive none, and leave no stone unturned to reach their final destination. They can hardly avoid the pangs of jealousy and tendency to overreact. 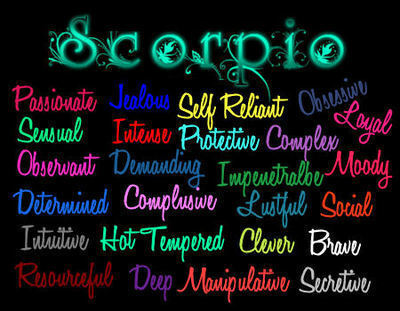 Scorpio astrology people should control their temper and inborn violent streak which cause unnecessary predicaments in their lives.